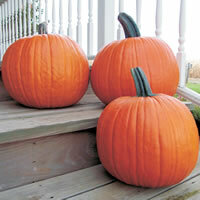 It's time for using and enjoying pumpkins, not for planting, but here's some information on both. Planting Dates: Pumpkins can be planted any time after the last frost, but to time your planting for Thanksgiving and Halloween, you have to do a little planning. If the variety needs 100 days to mature, pick the harvest date and count back 100 days or a few more for a cushion. In general, April 1 - July 31. 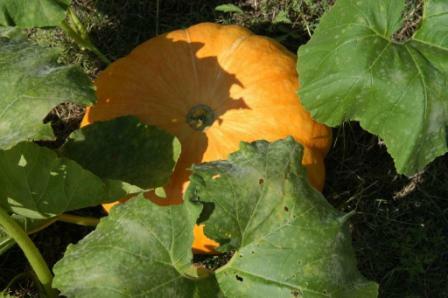 Culture: Pumpkins grow best in loose, coarse-textured soils; however, they will grow and be productive in almost any well-prepared soil. Mix in lots of compost, lava sand, greensand (in alkaline soils), and soft rock phosphate. Mulch the bare soil around the young plants as they start to grow. Fertilize three times with organic fertilizer and spray Garrett Juice at least monthly. Pumpkins have normal water requirements. One can purchase pumpkins from various sources, but to celebrate an eco-friendly Halloween, think about buying organic or pesticide-free pumpkins from your local pumpkin patch or farmer's market. Organic farmers use fewer pesticides that can contaminate waterways, lakes and oceans. When purchasing pumpkins, remember that strangely shaped pumpkins can be scarier than average round ones when carved. to receive an opportunity to get wonderful GIFTS.